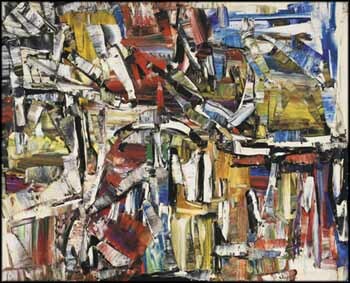 Towards the end of the 1950s, Jean Paul Riopelle used the palette knife with a greater freedom. There are still strokes that show the shape of his tool, as in the blue and yellow in the upper right of this painting or in the white on the left and right, as was his manner since 1949, when he decided to abandon the brush and exclusively use the palette knife. But we also see here strokes which seem freer, and which were obtained in smearing the paint in longer stretches than before. Nevertheless, the palette knife seems to have maintained its role of occlusion during the process of painting. You are never sure what the final result will be when you apply the knife to the paint medium squeezed from the tube onto the canvas. There is always an element of surprise here - an element of indetermination - which creates a challenge for the next stroke. It is clear that Riopelle enjoyed the process, and that it was not by chance that he titled this painting Jour de fêtes. All his paintings had to be a “feast,” otherwise they were destroyed by the artist himself. It is important to understand why Riopelle decided to abandon the brush. The palette knife is not just a tool that could reproduce (maybe less well!) what the brush was doing. A completely different concept is at play in both instruments. A brush, especially a thin brush, gives to the painter perfect visual control of the form he is painting. For instance, the thin outline that he creates between figure and background can reduce the contour of the form to almost nothing, and it then appears to detach from the background. On the contrary, the palette knife hides what the brush keeps under visual control. For a moment, the painter does not see what is happening under the knife. The palette knife introduced into the world of modern painting what Jacques Derrida used to recommend: “penser à ne pas voir" (to think at not seeing). Why? Because, that way, some adventures are made possible. Derrida gave the example of an événement (event, occurrence, happening). To be a real event, what is coming towards us has to be irruptive, inaugural and singular and something we do not see coming. An event that we see coming, that we anticipate, that we can predict, is not a real event. It is an event whose essential character of eventuality has been neutralized, stopped by anticipation. By introducing an element of invisibility, of unpredictability in the very process of painting with a palette knife, Riopelle creates an event with each stroke of his painting.